Running River Rug Cleaning understands that our valued clients desire not only clean rugs, rugs must be in a healthy state through rinsing with specialized softened water using organic and natural products available upon request. Running River is your best choice for rug repair. 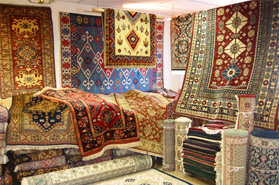 Our specialty is repairs of woven Oriental rugs. There may come a time when your treasured heirloom develops a hole or the binding on the side needs to be overcast. If your rug needs replacement of the fringe you can rest assured of the highest quality repair done by true artisans. Protect your rug against moths and prevent damage caused by the larva that consume fiber. Moth larva love to eat wool that is affected or disturbed, particularly in areas underneath furniture where you can’t vacuum often and with little to no foot traffic. Running River Rug Cleaning also provides a moth resistant storage service using special wrapping unattractive to moths and other insects. We can pick up or you can drop off your rug to our cleaning facility in Medford, NY. We will be happy to unload the rug from your vehicle. Rugs can also be shipped direct to our facility, simply contact our office for additional details and estimates.